Lyon, France's third-largest city is moving quickly forward to create a more bicycle-friendly future. 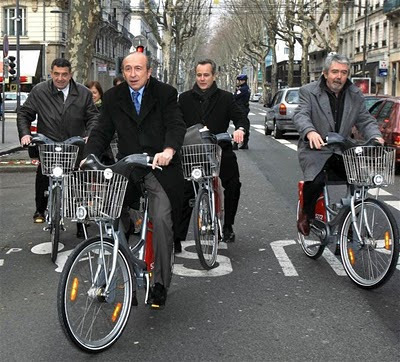 Above is the Mayor of Lyon and other dignitaries opening a double-wide lane for cyclists in a shared bus route corridor. Is France the Next Big Thing when it comes to bicycle infrastructure and increasing the number of Citizen Cyclists? Since July 2003, Greater Lyon has established and developed what it called "the soft mode map". The plan revolves around a simple desire: to offer a clean alternative to car use by developing green travel in the city - whether by bicycle, scooter, rollerblades or walking. With an estimated price of €90 million for the period 2008 to 2014, the plan is aiming at soft mode expansion to 5% of modal share for bicycle use by 2014 and 7.5% by 2020. To meet this objective, the action plan focuses of adding over 200 km of cycle paths, at 30 km per year. The balance sheet at the end of 2010 outlines the types of development achieved: 25% of the infrastructure are bicycle paths, 25% are greenways (mix of pedestrians and bicycles, as is the case, for example, on the banks of the Rhone), 24% are on-street bike lanes, 16% are bi-directional bike lanes, and 10% are bike lanes shared with busses. Encompassing all of this typology, 400 km of routes have already been built in the city - 90 km of it since 2008. However, Gerard Collomb, mayor of Lyon, said that "despite excellent progress, the dialogue continues with merchants, who are not particularly thrilled to see all the construction work outside their storefronts." Another field of action to promote bicycle use is the development and diversification of services, in particular the bike share programme Vélo'v. The traffic information signs will also be requisitioned in April 2011 in favor of Vélo'v, and communicate timely data. Jean-Louis Touraine, deputy mayor, summarizes the soft mode plan initiatives. "There is maximum satisfaction since the introduction of intermodal facilities and offerings. The safety of all is pretty well assured. And we achieved a 15% drop in traffic, which is a significant shift, and which will continue to improve. With this strategy, we ensure that cyclists are better respected and the pedestrians are better protected." On Wednesday, Senator-Mayor of Lyon, Gerard Collomb, inaugurated the two-way path serving the axis between Place Jean-Macé/avenue de Grande-Bretagne. It is a double-laned bicycle route in a single bus corridor, and it will link to many existing routes. Uploaded by chichechambery. - Watch the latest news videos. Thanks to Martin on Twitter for the link to the film.